The mistaken rapper needs to refocus his anger at Eratosthenes, because he put in work 2,000 years ago to prove that the Earth is indeed round. How'd he do it without access to complicated machinery? He observed that a long well was completely filled with sunlight at a very specific time of year (noon on the summer solstice, when the sun is at its highest point in the sky). He correctly stated that this meant that the sun light was coming directly down onto the Earth in a straight line. Any trees, structures, etc would not cast a significant shadow since the sunlight is directly on top of them. Since the sun is many times larger than the Earth, if the Earth is flat, sunlight would hit the Earth at a straight line across the entire "length" of the planet. However, Eratosthenes observed shadows at an angle on structures in his hometown of Alexandria, Egypt. This instantly means that sunlight hits the Earth at different angles, which means that the Earth must be curved. So boom B.O.B., you got served. But Eratosthenes wasn't done. He measured the angle of the shadows in Alexandria, and used it to calculate the circumference of the Earth to an astonishing precision - 25,000 miles (within 1% of the currently known value). Oh, he also invented geography. 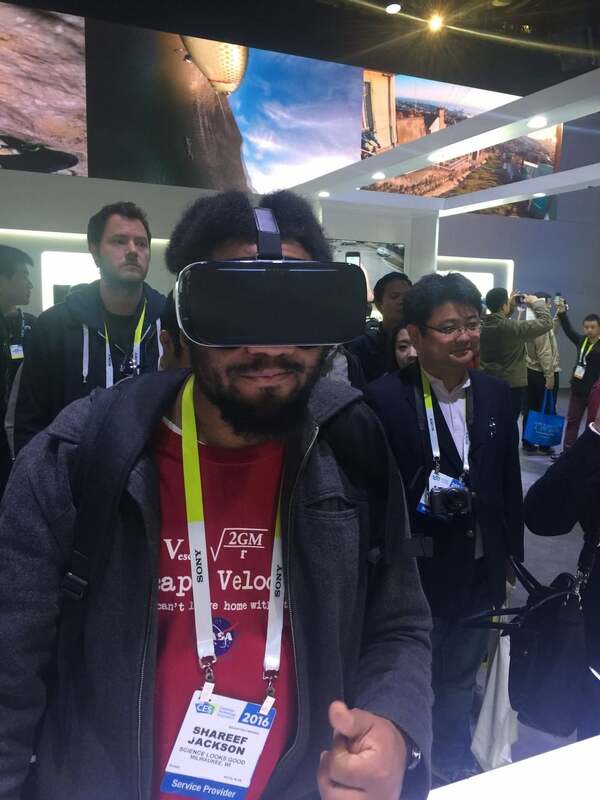 There were two themes that unexpectedly intertwined for me during the 2016 Consumer Electronics Show (CES) in Las Vegas: Virtual reality (VR) and the representation of Blackness at the annual trade show. VR uses a headset that enables you to experience a simulated world in all three dimensions: you can look behind, in front, above, and below you. I look like an absolute dork with the headset on, but the experience is worth it. Oculus stole the show with its premium Rift headset for PCs and Gear VR headset for Samsung mobile phones. The Rift is a $600 beast that requires a very powerful computer to run, resulting in unparalleled visuals. Gear VR can add an immersive effect to many videos, most notably videos shot by athletes doing crazy athlete things on a GoPro mobile camera. As I dipped in and out of these virtual worlds, I imagined the potential of bringing new experiences and cultures to the user. What if a kid in rural America can get a sense of the warmth and togetherness that can be experienced in areas that constantly top the country's homicide list? And vice versa? As I pondered that future, my mind was consistently brought back to the present whenever I observed the towering product displays that each company paid way too much money for. I was pleased to see a diverse array of races and gender represented on the displays. Unfortunately, the displays were more likely to serve as virtual representations of Blackness - my skin, my hair, my body - than the conerence attendees that I networked with. Blackness was on display at several CES booths. This was most apparent in the exhibit hall, where there were many brands that sold the image of Black Cool (shout out to Rebecca Walker) for their headphones, sound systems, and photos. Yet the very people staffing the booths and speaking the company line rarely looked like me. This introduces a conflict that I am slightly ashamed of. While I am happy that the power of using Blackness to sell products is not ignored due to a fear of scaring off a majority non-Black tech conference audience, I wish that the Black representation was not limited to a virtual screen or celebrity. Whenever a Black celebrity appeared, there was always a sense of awkwardness on both sides. Most of it was pretty harmless, like an old white gentleman asking me "Who is T-Pain and I am too old that I shouldn't care" (he was talking about Flo Rida). But there was also the intentional misuse of slang, with several people yelling out rap catch phrases ironically and then giggling afterwards. "Hey, look at this person who is so unlike us - let's gawk at the creature!" I often thought that these people didn't DESERVE this level of awesome Black celebrity. It's the same feeling I had 18 years ago when I saw a bunch of fellow college students barely responding to a still-underground Mos Def and Talib Kweli perform Redefinition in the way I always knew that they could. Flo Rida entered into a collboration with IK Multimedia for a new mobile mic recording solution. Some may say that I am adding unnecessary issues to a tech conference. But unfortunately, being Black in this country means that I can't opt out of seeing things from a certain perspective. Even something as well meaning as a drone reconnaissance van for taking photos of sports events can bring to mind an overzealous Ferguson police department unleashing advanced hardware against peaceful protestors. I am still hoping for the day where Blackness at major tech conferences is not only virtual, but realized both in the products being sold and the people selling them. Astronauts train for certain missions, including Hubble service repair, by performing in special underwater tanks. This simulates a zero gravity environment. Many widely known images of the galaxy have been taken by the Hubble Space Telescope, which turns 25 this year (time to rent a car!). NASA has created a fantastic video to discuss one of the later repairs to the Space Telescope Imaging Spectograph (STIS). It's a great example of geniuses at Johnson Space Center in Houston having to quickly come up with a solution when astronauts on a spacewalk could not correctly perform a repair. The advances from fixing the Hubble's mirror will be rolled into the James Webb Space Telescope, as well as ... your eyes. Check out the following video to see how the technology is used to improve LASIK vision correction. Check out more Hubble goodness here at the official NASA site, or the Hubble 25th anniversary site.